The original Wembley Stadium (/ˈwɛmbli/; formerly known as the Empire Stadium) was a football stadium in Wembley Park, London, which stood on the same site now occupied by its successor, the new Wembley Stadium. The demolition in 2003 of its famous Twin Towers upset many people worldwide. Debris from the stadium was used to make the Northala Fields in Northolt, London. Wembley hosted the FA Cup final annually, the first in 1923, the League Cup final annually, five European Cup finals, the 1966 World Cup Final, and the final of Euro 96. Brazilian footballer Pelé once said of the stadium: "Wembley is the cathedral of football. It is the capital of football and it is the heart of football," in recognition of its status as the world's best-known football stadium. The stadium hosted the 1948 Summer Olympics, rugby league’s Challenge Cup final, and the 1992 and 1995 Rugby League World Cup Finals. It also hosted numerous music events, including the 1985 Live Aid charity concert, and in professional wrestling hosted the WWF’s SummerSlam in 1992. Aerial view of Wembley Stadium, 1991. The stadium's first turf was cut by King George V, and it was first opened to the public on 28 April 1923. Much of Humphry Repton's original Wembley Park landscape was transformed in 1922–23 during preparations for the British Empire Exhibition of 1924–25. First known as the British Empire Exhibition Stadium or simply Empire Stadium, it was built by Sir Robert McAlpine for the British Empire Exhibition of 1924 (extended to 1925). At the end of the exhibition, an entrepreneur Arthur Elvin (later to become Sir Arthur Elvin) started buying the derelict buildings one by one, demolishing them and selling the scrap. The stadium had gone into liquidation after it was pronounced "financially unviable". Elvin offered to buy the stadium for £127,000, using a £12,000 downpayment and the balance plus interest payable over ten years. After complications following the death of James White, the original Stadium owner, Elvin bought Wembley Stadium from the new owners, Wembley Company, at the original price, since they honoured Elvin's original deal. They then immediately bought it back from Elvin, leaving him with a healthy profit. Instead of cash, he received shares, which gave him the largest stake in Wembley Stadium, and he subsequently became chairman. The electric scoreboard and the all-encircling roof, made from aluminium and translucent glass, were added in 1963. The Royal Box in April 1986. The stadium's distinctive Twin Towers became its trademark and nickname. Also well known were the 39 steps needed to be climbed to reach the Royal box and collect a trophy (and winners'/losers' medals). Wembley was the first pitch to be referred to as "Hallowed Turf", with many stadia around the world borrowing this phrase. In 1934, the Empire Pool was built nearby. The "Wembley Stadium Collection" is held by the National Football Museum. The stadium closed in October 2000 and demolition commenced in December 2002, completing in 2003 for redevelopment. The top of one of the twin towers was erected as a memorial in the park on the north side of Overton Close in the Saint Raphael's Estate. Wembley is best known for hosting football matches, having hosted the FA Cup Final annually as well as numerous England International fixtures. The Empire Stadium was built in exactly 300 days at the cost of £750,000. Described as the world's greatest sporting arena, it was ready only four days before the "White Horse" Final in 1923. The FA had not considered admission by ticket, grossly underestimating the number of fans who arrived at the 104 gates on match day. However, after the match, every event, apart from the 1982 replay, was ticketed. The first event held at the stadium was the FA Cup Final on 28 April 1923 between Bolton Wanderers and West Ham United. This is known as the White Horse Final. Such was the eagerness of fans and casual observers to attend the final at the new national stadium that vast numbers of people crammed through the 104 turnstiles into the stadium, far exceeding its official 127,000 capacity. The crowds overflowed onto the pitch as there was no room on the terraces. Estimates of the number of fans in attendance range from 240,000 to well over 300,000. It is estimated that another 60,000 were locked outside the gates. The FA were forced to refund 10% of the total gate money to fans unable to reach the terraces. The White Horse Final has the highest ever unofficial "non-racing" sports attendance in the world. It was thought that the match would not be played because of the volume of spectators inside the stadium that had spilled onto the pitch. That was until mounted police, including Police Constable George Scorey and his white horse, Billy, slowly pushed the masses back to the sides of the field of play for the FA Cup Final to start, just 45 minutes late. In honour of Billy, the footbridge outside the new Wembley Stadium has been named the White Horse Bridge. The official attendance is often quoted as 126,047. The match was a 2–0 victory for Bolton Wanderers, with David Jack scoring the first ever goal at Wembley. The 1953 FA Cup Final between Blackpool and Bolton Wanderers was dubbed the "Matthews Final" after Blackpool's winger Stanley Matthews. At age 38, he was making his third and ultimately his final attempt at winning an FA Cup medal. In the previous six years, he failed to earn a winner's medal against Manchester United in 1948 and Newcastle United in 1951. It featured a hat-trick by Blackpool's Stan Mortensen in his side's 4–3 win, with Matthews almost single-handedly turning the match around for Blackpool, who had trailed 3–1 to Bolton Wanderers before fighting back to win the match. It remained the only hat-trick ever scored in an FA Cup Final at the original Wembley. The FA Cup final was played there in April or May until 2000 (excluding the 1970 replay when Chelsea beat Leeds United at Old Trafford). It was also the venue for finals of the FA Amateur Cup, League Cup (except for the early years when this was settled on a home and away basis) and in later years the Associate Members' Cup and the Football League promotion play-off finals (in the early years of play-offs they were home and away fixtures). The 1988 final of the Middlesex Charity Cup was also played there. 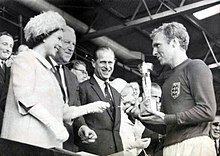 The Queen presents the Jules Rimet Trophy to England's team captain Bobby Moore after the 1966 World Cup Final. Prior to the 1923 Wembley stadium, international football games had been played by England at various stadia. Most early internationals (including the first ever international football match (1870)) were played at The Oval, which opened in 1845 as the home ground of Surrey County Cricket Club and would in 1880 host the first Test match played in England. For the first 27 years, the only International England games played at Wembley were fixtures against Scotland, with other games played elsewhere until 1951. The first team other than Scotland to face England at the venue was Argentina. In 1956 and 1971, it was the venue of the home matches of the Great Britain national football team for the qualification matches to the Summer Olympic Games against Bulgaria. In 1966, it was the leading venue of the FIFA World Cup. It hosted nine matches, including the final, where tournament hosts England won 4–2 after extra time against West Germany. Seven years later, Wembley was the venue for a specially arranged friendly between teams called "The Three" and "The Six" to celebrate the United Kingdom joining the European Union. The match finished 2-0 to "The Three". In 1996, it was the principal venue of UEFA Euro 1996, hosting all of England's matches, as well as the tournament's final, where Germany won the UEFA European Championship for a third time after defeating the Czech Republic 2–1 with the first international golden goal in football history. Germany had earlier defeated England on penalties in the semi-final after a 1–1 draw, with Gareth Southgate missing a penalty for England in the shoot-out. England's final two competitive matches played at the stadium resulted in 0–1 defeats for England to Scotland and Germany respectively. The first defeat was in the play off for the Euro 2000 qualifiers in November 1999, but England still went through as they won the other leg 2–0 at Hampden Park. However, the final match at Wembley was the opening qualifier for the 2002 World Cup, and defeat prompted the resignation of England manager Kevin Keegan at the end of the match after just 18 months in charge. In all, the stadium hosted five European Cup finals. The first two were 1963 final between Milan and Benfica, and the 1968 final between Manchester United and Benfica. In 1971, it again hosted the final, between Ajax and Panathinaikos, and once more in 1978, this time between Liverpool and Club Brugge, another in 1992, when Barcelona played Sampdoria. Wembley has also hosted two European Cup Winners' Cup finals: in 1965, when West Ham United defeated 1860 Munich, and in 1993, when Parma defeated Royal Antwerp. It was also the venue for Arsenal's home Champions League matches in 1998–99 and 1999–2000. It has hosted an individual club's home matches on two other occasions, in 1930, when Leyton Orient played two home Third Division South matches while their Lea Bridge Stadium was undergoing urgent remedial works; and in 1930–31 for eight matches by non-League Ealing A.F.C. It was also to be the home of the amateur club which made several applications to join the Football League, the Argonauts. In March 1998, Arsenal made a bid to purchase Wembley in hope of gaining a larger stadium to replace their Highbury ground, which had a capacity of less than 40,000 and was unsuitable for expansion. However, the bid was later abandoned in favour of building the 60,000 capacity Emirates Stadium, which was opened in 2006. On 20 May 2000, the last FA Cup final to be played at the old Wembley saw Chelsea defeat Aston Villa with the only goal scored by Roberto Di Matteo. The final competitive club match there was the 2000 First Division play-off final on 29 May, between Ipswich Town and Barnsley, a 4–2 win resulting in promotion to the Premier League for Ipswich. The last club match of all was the 2000 Charity Shield, in which Chelsea defeated Manchester United 2–0. The last international match was on 7 October in Kevin Keegan's last game as England manager. England were defeated 0–1 by Germany, with Dietmar Hamann scoring the last goal at the original Wembley. On that day, Tony Adams made his 60th Wembley appearance, a record for any player. Adams also claimed England's final goal at the stadium, having scored in the previous home fixture against Ukraine on 31 May. In the sport of rugby league, the RFL held its Challenge Cup Final at Wembley from 1929 onwards. The stadium was also regularly used by the sport for major international matches, such as Great Britain versus Australia. In 1949 the France national rugby league team became the first French national team of any sport to win at Wembley. The largest crowd for a Challenge Cup Final at Wembley was set in 1985 when Wigan beat Hull F.C. 28–24 in front of 99,801 spectators, which as of 2017 remains the second highest rugby league attendance in England behind only the 1954 Challenge Cup Final replay at Bradford's Odsal Stadium when a then world record attendance of 102,575 saw Warrington defeat Halifax 8–4 (the original 1954 cup final at Wembley, drawn 4–4, was played in front of 81,841 fans). The stadium set the international record crowd for a rugby league game when 73,631 turned out for the 1992 Rugby League World Cup Final between Great Britain and Australia (since beaten by the 74,468 attendance for the 2013 RLWC Final at Old Trafford). The Mal Meninga-led Australian team won the game 10–6 on the back of a Steve Renouf try in the north-east corner and Meninga's goal kicking. The 1995 World Cup Final between England Australia was also played at Wembley with 66,540 spectators watching Australia win 16–8. The final of the 1999 Challenge Cup was the last to be played at the stadium and was attended by 73,242 fans, with the annual fixture moving to other grounds (Murrayfield Stadium, Millennium Stadium and Twickenham) before returning to the new Wembley upon its completion in 2007. New international rugby league attendance record. Wembley was the main venue for the 1948 Summer Olympics, with Fanny Blankers-Koen and Emil Zátopek among the notable winners in athletics. The Stadium also hosted the semifinals and finals of the Olympic hockey and football tournaments, the Prix des Nations event in the equestrian competition, and a demonstration match of lacrosse. Motorcycle speedway first took place at Wembley in 1929, and operated until the outbreak of World War II in 1939, a few days before the 1939 World Championship Final was due to be held, but was cancelled as a result of the war. The Wembley Lions returned in 1946 and operated in the top flight until the end of the 1956 season winning a number of League titles. A short lived revival saw the Lions in the British League in the 1970 and 1971 seasons. Lionel Van Praag (1936), Tommy Price (1949), and Freddie Williams (1950 and 1953), all won World Championships whilst riding for Wembley. The ashes for the speedway track were supplied by Richard Biffa Ltd who's operating base at the time was in Wembley Hill Road. Richard Biffa later became Biffa Waste Services. The Lions were formed by the Wembley Stadium chairman Sir Arthur Elvin. Between 1936 and 1960 Wembley hosted all of the first 15 finals of the Speedway World Championship. It hosted another nine World Finals before the last one at Wembley took place in 1981 in front of 92,500 fans, just shy of the venue's record speedway attendance of 95,000 set at the 1938 World Final. Riders who won the World Championship at Wembley include; inaugural champion Lionel Van Praag (Australia), Jack Milne (United States), Bluey Wilkinson (Australia), Tommy Price (England), Freddie Williams (Wales), Jack Young (Australia – the first two-time winner, first back-to-back winner and the first second division rider to win the title), Ronnie Moore (New Zealand), Ove Fundin (Sweden), Barry Briggs (New Zealand), Peter Craven (England), Björn Knutsson (Sweden), Ole Olsen (Denmark), Bruce Penhall (United States – the winner of the 1981 World Final), and legendary New Zealand rider Ivan Mauger. With four wins, Sweden's Ove Fundin won the most World Championships at Wembley, winning in 1956, 1960, 1963 and 1967. Wembley also hosted the Final of the Speedway World Team Cup in 1968, 1970 and 1973 won by Great Britain (1968 and 1973) and Sweden (1970). The speedway track at Wembley Stadium was 345 metres (377 yards) in length and was notoriously difficult to ride for those not used to it. Despite regularly being used for World Championship and other British championship meetings, Wembley long had a reputation as a track that was difficult to pass on which often led to processional racing. Among those who never performed well there despite their credentials include 1973 World Champion Jerzy Szczakiel (who won his title at home in Poland and two weeks later under difficult circumstances failed to score in the World Team Cup Final at Wembley), while others such as Ivan Mauger and Ole Olsen often seemed to find their best form at the stadium. The track itself was located inside of the greyhound racing track, but intersected the stadium's playing field at the corners. The pits were located in the tunnel at the eastern end of the stadium. The track record at Wembley will forever be held by Denmark's World Champion of 1984, 1985 & 1988 Erik Gundersen. In Heat 6 of the 1981 World Final, Gundersen set the 4-lap record (clutch start) of 66.8 seconds. As this was the last time the stadium was used for speedway racing, it remains the track record. Two meetings were held at Wembley in 1974 promoted by Trevor Redmond. The first meeting held featured BriSCA Formula 1 Stock Cars and National Hot Rods. The second meeting featured the BriSCA Formula 2 Stock Cars World Final with F1's in support. Before the first meeting the Wembley groundsman threatened to resign over possible damage to the hallowed turf. The pitch was surrounded by wooden beams and little damage was caused. Though the venue was not traditionally a regular host of rugby union matches, England played a friendly against Canada on 17 October 1992, as their regular home stadium at Twickenham was undergoing redevelopment. Wales played their Five Nations and autumn international home matches at Wembley (as Twickenham Stadium would not accommodate them) while Cardiff Arms Park was being rebuilt as the Millennium Stadium in the late 1990s (a deal reciprocated for FA Cups during the construction of the new Wembley Stadium). In total there were seven internationals. Wembley was a regular venue for greyhound racing. It was the first sport Sir Arthur Elvin introduced to the stadium. The opening meeting was in 1927. The greyhound racing provided the stadium with its main source of regular income, especially in the early decades, and continued to attract crowds of several thousand up until the early 1960s. The stadium staged its last greyhound race meeting in December 1998 with the owners, the Greyhound Racing Association, citing economic reasons and the lack of plans for a greyhound track in the stadium's redevelopment. Two of the biggest events in the greyhound racing calendar are the St Leger and Trafalgar Cup[self-published source] Both were originally held at Wembley, the St Leger from 1928 until 1998 after which it moved to Wimbledon Stadium and the Trafalgar Cup from 1929 until 1998 after which it moved to Oxford Stadium. In 1931 the famous greyhound Mick the Miller won the St Leger. Wembley's owners' refusal to cancel the regular greyhound racing meant that the match between Uruguay and France in the 1966 FIFA World Cup was played at White City. The National Football League held nine preseason American football games at Wembley between 1983 and 1993. The Minnesota Vikings and the St. Louis Cardinals played the first game on 6 August 1983. The Detroit Lions and the Dallas Cowboys played the last game on 8 August 1993. The United States Football League also played an exhibition game there on 21 July 1984 between the Philadelphia Stars and Tampa Bay Bandits. The London Monarchs of the World League of American Football played at the venue in 1991 and 1992. Wembley hosted World Bowl '91 the inaugural World Bowl where the Monarchs defeated the Barcelona Dragons 21–0. From 1958 until the mid-1970s, hurling and gaelic football tournaments known as the "Wembley Tournaments" were held at Wembley Stadium to bring the Irish sports to expatriates in Britain at the time. Several Gaelic football games were played in Wembley Stadium, most of them exhibition matches, most notably Kerry and Down in 1961. The stadium also staged women's field hockey matches in which England appeared in their annual match between 1951 and 1969 and then from 1971 to 1991. On 18 June 1963, Wembley hosted a heavyweight boxing match between London native boxer Henry Cooper and American rising star Muhammad Ali in front of 35,000 spectators. On 26 May 1975, in front of 90,000 people, Evel Knievel crashed while trying to land a jump over 13 single decker city buses, an accident which resulted in his initial retirement from his daredevil life. In 1992, the World Wrestling Federation (now known as WWE) drew a sellout of 80,355 when SummerSlam was hosted at Wembley Stadium. The main event featured English wrestler Davey Boy Smith winning the Intercontinental Championship from Bret Hart. As of April 2016, the WWE considers this to be their fourth largest live gate in history behind only WrestleMania 32 (2016) which drew a reported 101,763, WrestleMania III (1987) which drew a reported 93,173 and WrestleMania 29 (2013) which drew 80,676 fans. The stadium became a musical venue in August 1972 with The London Rock and Roll Show, an all star concert. It later played host to a number of concerts and events, most notably the British leg of Live Aid, which featured such acts as David Bowie, Queen, Paul McCartney, Elton John, The Who, Dire Straits and U2, held at the stadium on 13 July 1985. Phil Collins performed at Wembley, then boarded a helicopter to London Heathrow Airport and took a British Airways Concorde to Philadelphia, Pennsylvania, to perform at the American segment of Live Aid at JFK Stadium on the same day. Other charity concerts which took place in the stadium were the Human Rights Now! concert, The Nelson Mandela 70th Birthday Tribute Concert, Nelson Mandela: An International Tribute for a Free South Africa Concert, The Freddie Mercury Tribute Concert for AIDS Awareness and the NetAid charity concert. During Michael Jackson's Bad World Tour in 1988, seven sold-out concerts were staged at Wembley which included five in a row, and two at a later date. Each concert had an attendance of 72,000 people. According to the Guinness Book of World Records, Jackson set a new world record with 504,000 people attending the seven sold out concerts. He was given a special award by Wembley Stadium Officials for achieving this milestone. The concert on 16 July 1988 was attended by Princess Diana and Prince Charles. The DVD of this concert (Michael Jackson: Live at Wembley July 16, 1988) was released on 18 September 2012 as part of the 25th Anniversary reissue of his 1987 hit album Bad and also as a stand-alone DVD. A further five sold-out concerts followed in 1992 during his Dangerous World Tour and his last three shows in 1997 during HIStory World Tour brought total ticket sales to over 1.1 million. To date, this record has not been broken. Tina Turner (5 sold out concerts at Wembley Stadium, three in 1996 and two in 2000. Recorded during her Twenty Four Seven Tour for the live tour DVD in the year 2000). The Who (18 August 1979: "The Who And Friends Roar In". Following a series of smaller warm-ups this was the band's first major concert after the death of drummer Keith Moon the previous year. U2 (9 times between 1985 and 1997) including two nights on the 4th (European) leg of their "Zooropa" tour on 11–12 August 1993. Bon Jovi played three consecutive nights in June 1995, which were filmed for Live from London. They also played on 18 August 2000, and were the last musical act to play at the old Wembley before it was closed. Cliff Richard played 16 and 17 June 1989. The concert was recorded and released as From a Distance: The Event album and VHS/DVD. Guests included The Shadows, Aswad, Kalin Twins, The Searchers, Gerry and the Pacemakers, The Dallas Boys, The Vernons Girls, Stock Aitken Waterman, Tony Meehan and Jet Harris. Crosby, Stills, Nash and Young played 14 September 1974. Guests included Joni Mitchell, The Band, Jesse Colin Young. Aerosmith with support from Lenny Kravitz were the guests at the Twin Towers Ball on 26 June 1999. Cecil Freeman Gregg's crime novel Tragedy at Wembley (Methuen, 1936) sees his detective character Inspector Cuthbert Higgins investigate a murder at the stadium. The stadium features in the opening scene of the film The King's Speech (2010). The 1948 Olympic Marathon and the 1923 Stadium feature in the South Korean war film My Way (2011), though the marathon is clearly filmed in Riga, rather than London, and the stadium standing in for Wembley has an anachronistic electronic scoreboard. John Betjeman is shown standing in the Stadium in his 1973 BBC film Metroland, though, as John Bale has pointed out in Anti-Sport Sentiments in Literature: Batting for the Opposition (Routledge, 2007), he shows no real interest in Wembley's sporting connections, either here or elsewhere. In episode 11 of the 2nd series of the revived Doctor Who, the Doctor recalls visiting the 1948 London Olympics and says that he wanted to light the Olympic Flame. There is a persistent myth that a small locomotive met with a mishap when Watkin's Folly was being demolished, or the Empire Stadium built, and was buried under what became the "sacred turf" (though in some versions it is a carriage filled with rubble). When the Stadium was rebuilt no locomotive or carriage (or stone circle…) was found, though the foundations of Watkin's tower were. ^ Campbell, Denis (13 June 1999). "Foster topples the Wembley towers". The Guardian. Retrieved 2 March 2012. "Wembley loses twin towers". BBC News. 29 July 1999. Retrieved 2 March 2012. "The road to Wembley". The Daily Telegraph. 25 September 2002. Retrieved 2 March 2012. ^ Staff (17 June 1924). "Asks Premier to Stop Rodeo Steer Roping; British Society Appeals 'in Name of Humanity' Against Contest of American Cowboys". The New York Times. ^ Sutcliffe, Anthony (2006). London: An Architectural History. Yale University Press. ISBN 0-300-11006-5. p. 172 (via Google Books). Retrieved 4 February 2009. ^ "Archived copy". Archived from the original on 2 May 2009. Retrieved 18 May 2009. CS1 maint: Archived copy as title (link). Wembley Stadium. ^ de Lisle, Tim (14 March 2006). "The height of ambition". The Guardian. Retrieved 29 September 2008. ^ a b c Jacobs, N and Lipscombe, P (2005). Wembley Speedway: The Pre-War Years. Stroud: Tempus Publishing. ISBN 0-7524-3750-X. ^ "Gates' Microsoft Becomes Wembley Stadium Backer". Forbes. 20 October 2005. ^ Collett, Mike (2003). The Complete Record of The FA Cup. p. 35. ISBN 1-899807-19-5. ^ Bateson, Bill; Albert Sewell (1992). News of the World Football Annual 1992/93. Harper Collins. ISBN 0-85543-188-1. ^ Matthews, Tony (2006). Football Firsts. Capella. ISBN 1-84193-451-8. ^ a b "The Matthews Final". BBC News. 24 February 2000. Retrieved 20 July 2009. ^ Francis, Tony (22 August 2005). "Future returns to the past". The Daily Telegraph. Retrieved 14 January 2010. ^ Barker, Philip (June 2003). "Wembley Stadium – An Olympic Chronology 1923–2003" (PDF format). Journal of Olympic History. LA84 Foundation. Retrieved 14 January 2010. ^ Inglis, Simon (1984). The Football Grounds of England and Wales. London: Willow Books. p. 236. ^ a b Twydell, Dave (2001). Denied F.C. – The Football League Election Struggles. Harefield: Yore Publications. p. 31. ISBN 978-1-874427-98-8. ^ Hodgson, Guy; Yates, Andrew (13 March 1998). "Football: FA Infuriated by Arsenal's Bid for Wembley". The Independent. Retrieved 15 August 2012. ^ Scott, Matt (9 May 2005). "Ipswich Bank on Better Luck in the Annual Lottery – Suffolk Club Grow Used to End-of Season Suffering". The Guardian. Retrieved 15 August 2012. ^ "Player profile: Tony Adams". The Daily Telegraph. ^ "England v Ukraine: previous meetings". The Daily Telegraph. ^ "The History Of Rugby League". Rugby League Information. napit.co.uk. Retrieved 2 January 2014. ^ AAP (1 December 2013). "Record rugby league crowd for World Cup final". stuff.co.nz. Retrieved 1 December 2013. ^ 1948 "Summer Olympics official report" Archived 16 July 2011 at the Wayback Machine (PDF format). LA84 Foundation. pp. 42, 44–6. ^ Bamford, R.; Jarvis J.(2001). Homes of British Speedway. Stroud: Tempus Publishing ISBN 0-7524-2210-3. ^ Harris, Neil (6 October 2000). "Magnificent monument to vision of one man". The Independent. Retrieved 29 September 2008. ^ Williams, Richard. "Greyhound racing: Hounded out after a 71-year run". independent.co.uk. Retrieved 19 November 2014. ^ Baiden, Gary (2009). The History of Oxford Stadium. authorhouse. ISBN 978-1-4490-2054-5. ^ "Tina Turner Wembley Events". ^ "Setlist for Nine Inch Nails concert at Wembley Arena, 31/08/91". ^ "Golden Age of Detection Wiki". Retrieved 27 June 2016. ^ "Marathon race in 1948 Olympic Games". 19 June 2012. Retrieved 27 June 2016. ^ Bale, John (2007). Anti-Sport Sentiments in Literature: Batting for the Opposition. Routledge. p. 91. ISBN 0415596254. ^ "Once Upon a Train (Railway Myths and Legends)". The Beauty of Transport. 27 February 2013. Retrieved 27 June 2016. ^ "JISCMail – BRITARCH Archives". www.jiscmail.ac.uk. Retrieved 27 June 2016. Wikimedia Commons has media related to Wembley Stadium (1922–2003).